Three years ago, Prospect Avenue was identified as one of the ten most dangerous streets in America and was featured on an HBO special. The special focused on the decaying infrastructure, crime, drug dealing, and prostitution that came from years of neglect and disinvestment. The program did more than highlight economic and social deterioration; it confirmed the lack of value in policies designed to deal with such troubles. This summer, to bring attention to the plight of the people in the area, I decided to camp out on the corner of 39th & Prospect. For one week, I spent the night on the corner under a tent with representatives of MOVE-UP and others, talking with people about how we could work to improve this blighted area. The idea came from a 31-year old City Councilman named Cory Booker who represents the poorest ward in Newark, New Jersey and who camped out in the most crime-ridden area of Newark. Booker represents a new generation of political activism and leadership that is less reliant on old solutions to complex problems. Instead, armed with an M.A. in sociology from Stanford and a law degree from Yale, this Rhodes Scholar subscribes to a different philosophy. His philosophy is one of "New Ideas and Enduring Values." It expresses what separates the old guard from progressive leaders. The philosophy holds allegiance to fundamental core values, not allegiance to local government programs or policies enacted to promote those values. To be sure, constant innovation in organizing public resources to help citizens solve problems is one of the most significant of the "enduring values." However, many remain addicted to "programmitis," talking about what they want to do in the language of local government acronyms. The people I met during the camp-out expressed a deep desire for change based on their values - they wanted to be empowered. In fact, 39th & Prospect should be revitalized with "value-based policy development." This is a process in which one identifies values the affected community seeks to promote, then creates broad policy goals to reflect them, and finally develops ideas designed to advance those values and achieve policy goals. The process is simple; it employs an instrument called "the policy tree." Community values are the roots of the tree, policy goals are the trunk, and progressive programs are the branches. This is excellent therapy for those of the old guard who are in recovery from programmitis and the right way to keep priorities straight. This process could easily be implemented through our FOCUS Plan, maximizing neighborhood and citizen participation. It is important to realize that the people who live around 39th & Prospect do not simply want people in elected office to share their values and ideas. They want them to advance these values in the form of substantive public policy that directly affects their lives. Only when values are present can we send a message to the people on the corner, that where you start out in life has nothing to do with where you ultimately end up. Troy Nash was elected to the Kansas City, Missouri City Council in April of 1999. He serves as Vice Chairman of the Planning, Zoning, and Economic Development Committee. 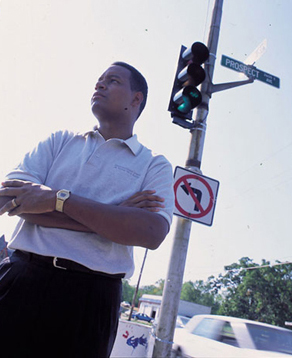 Councilman Troy Nash, 3rd District at Large, contemplates the future of 39th and Prospect.